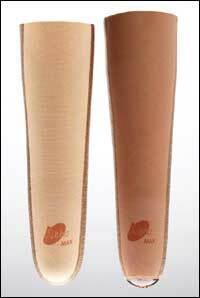 Ongoing Care Solutions offers a complete line of orthotics, including WEL-KARE" Night Splints at only $27.00 each! 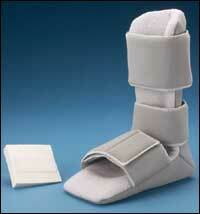 WEL-KARE Passive Night Splint Nighttime solution for plantar fasciitis. 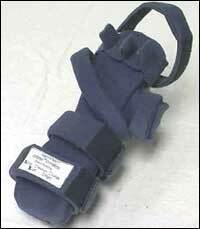 WEL-KARE Stretch Night Splint Adjustable solution for plantar fasciitis. Visit www.ongoingcare.com to view these Night Splints as well as our complete, exceptional product line. Apex Foot Health Industries, foot orthotics and orthotic materials manufacturer and supplier since 1946, introduces a comprehensive new orthotic line designed especially for diabetics and to comply with Medicare's new K Code definitions. The Conform ThermoThotic line consists of eight unique insert styles to fill patient needs. Four base material options, two Apex exclusives, include: ED-9 Polyetherdiol heat-moldable urethane compound; and Plastazote X-Firm 45 Durometer closed-cell polyethylene foam. The Conform ThermoThotic line also includes styles featuring Thermosky EVA and Plastazote Firm bases. Medicare's new K-0628 insert code replaces A-5509 which is no longer accepted after June 30, 2004. PEL Supply is offering a 50% discount on new EZTrim" plastic socket edging material from MICA Tools. The special introductory price, applying to orders placed throughPEL from June 1 through July 16, 2004, is only $12.15! MICA notes that EZTrim extends the life of suspension sleeves and liners. It protects against tears and rips of suspension sleeves and helps prevent liners from getting damaged or torn. Using EZTrim reduces worry about finishing socket edges. Easily cut to length; EZTrim is heat-moldable for uncomplicated application at 60°-80° to a clean, dry, wax-free surface. 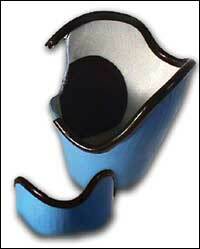 EZTrim fits prosthetic sockets up to 1/8" wall thickness. The complete kit includes the EZTrim strip (3' X 1/8"), glue, and fabrication instructions. If you've been waiting to discover the benefits of the new Alpha® MAX liners, wait no more! May 1July 31, 2004, SPS will provide a FREE Maglite® Flashlight with purchase of two Alpha MAX liners. Alpha MAX incorporates the skin-friendly thermoplastic gel, with mineral oil and vitamin E, found in original Alpha liners. The major difference is that Alpha MAX integrates a custom fabric outer cover demonstrating three times greater abrasion resistance than all other liners available today. This fabric eliminates gel separation and the Stabilizing Strip reduces movement and gel delamination offering the perfect interface solution for highly active patients requiring extremely durable liners. Water- and shock-resistant, the rugged, machined aluminum Maglite Flashlight features a high-intensity adjustable light beam. 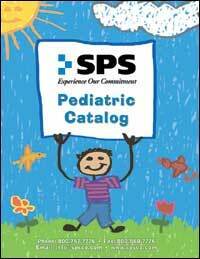 SPS proudly presents their 2004 Pediatric Catalog. Says Connie Withers, vice president of Sales, "SPS has received numerous requests from customers who specialize in pediatrics, to put together a catalog which addresses the unique, exclusive and varied offerings SPS can provide..."
The 2004 Pediatric Catalog features detailed product specs, fitting and measurement information for new prosthetic componentry, orthotic systems, fabrication supplies, and exclusively pediatric patient aids. New lines featured include: Bledsoe Wee Walkers, Ohio Willow Wood PPOD line, Ossur Junior Solutions, and OTS StepLock and brace componentry. New products from "old" favoritesAircast, Alps, Aspen, Becker, Camp, Coyote Designs, Fillauer, Hosmer, Medipro, Orthomerica, RCA, Seattle and Silipos are also showcased. Call now for your 2004 Pediatric Catalog. SWISSEX 1900 portable cast cutter, available from Friddle's Orthopedic Appliances, cuts or removes conventional and synthetic fiber casts and trims or reshapes orthopedic products. SWISSEX 1900 is available in Standard (700-1900) with up to 40 minutes cutting time, and Professional (700-1900P) with up to 60 minutes cutting time when fully charged. Makes cast removal or reshaping fast, safe, and easy! Friddle's Orthopedic has become one of the first companies in the O&P industry to offer a variable speed router that is powered by an AC motor. New technology has made it economically possible to vary the speed of AC motors, thus eliminating the AC/DC motors most frequently used in the past. This new powered router runs from 0 to 3600 rpm. 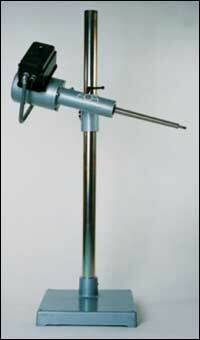 Shaft tolerances of .0005" insure smooth, vibration-free service. Maintenance is minimal and durability is unsurpassed. Juzo announces the arrival of Juzo Silver Compression Stockings, useful in the prevention and treatment of venous stasis ulcers by increasing blood circulation throughout the legs. Juzo Silver Compression Stockings are knitted with 23% X-STATIC® silver threads. By incorporating silver into a compression stocking, Juzo has developed a product that is naturally antimicrobial, anti-odor and cool-wearing. These added benefits make Juzo Silver Compression Stockings the ideal compression therapy solution for wound care patients by extending the antimicrobial shield beyond the wound dressing. Otto Bock HealthCare recently introduced four new thermoplastic prefabricated AFOs to its orthotic product line, offering you a broad range of heat-moldable fitting solutions that are available right off the shelf. They're lightweight and low-profile, with a pleasing matte finish, and with control solutions from a simple Blank to Posterior Leaf Spring, Otto Bock's AFOs are a fast and high-quality solution at an amazing price. The new LuXon Journey from Otto Bock HealthCare is designed to meet the needs of your moderately active patients. Skillfully engineered, it incorporates the Multi-Sphere 360" and a separate heel plate to offer the user terrain conformance and exceptionally smooth rollover. Backed by a 36-month warranty, the Journey is the perfect solution for patients who need a natural gait and multiaxial function whether they're chasing grandchildren, playing 18 holes, traveling, or enjoying nature. Equally important, the LuXon Journey requires less set up and maintenance than comparable prosthetic feet, so you and your patients can spend more time enjoying the things you love to do. 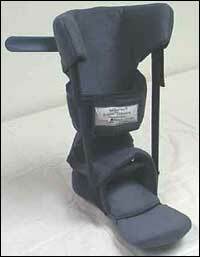 NeuroFlex Orthotics Inc. introduces a recumbent Ankle/Foot Orthosis (AFO). The NeuroFlex® Eclipse" AFO treats ankle/foot inversion, eversion, and plantar flexion while controlling unwanted hip rotation. Flexible calf extensions with adjustable elastic straps provide Low-Load Prolonged-Stretch effectively treating ankle/foot contractures. A flexible Toe Guard "gives" with involuntary toe flex. The Eclipse AFO's soft, breathable cover is treated with KOOL-WICK" and BACTI-BAN" to keep skin cool and dry, protect skin integrity, and reduce cover odor. Use Eclipse AFO to treat joint stiffness, adaptive tissue shortening, and abnormal ankle/foot tone and spasticity. If your patient has the potential to bear weight and walk again, treat their plantarflexion contracture with NeuroFlex Eclipse orthotic therapy. NeuroFlex Orthotics Inc. has launched the NeuroFlex® Eclipse" Finger Flex Wrist/Hand/Finger Orthosis. Designed with bioengineered therapeutic flex at the wrist, MCP, and PIP joints of the fingers, the Eclipse Finger Flex WHFO reduces abnormal tone and spasticity of the wrist/hand/fingers. Rather than immobilizing the hand during an episode of tone; the Eclipse Finger Flex WHFO "gives", allowing affected muscles to shorten, reducing Muscle Spindle firing and involuntary muscle contractions. The Eclipse Finger Flex WHFO cover is made of soft, breathable foam and moisture-wicking KOOL-WICK" fabric treated with BACTI-BAN" to protect skin integrity and reduce cover odor. The proprietary strapping system allows a custom fit. Patients report greater comfort compared to static hand splints.